80 Daws Lane, otherwise known as the Civil Defence Building, was the catalyst for the creation of the NW7hub charity. With the loss of a garden centre close by and a search for an alternative space which could meet identified community need, the site became the focus of many months of discussion with its owners Barnet Council to transform it into a new community hub. Whilst the site has never been proactively managed or programmed, the building has been accessed by the community and various Council departments since 1939. It was built as a decontamination centre for Hendon should a poisonous bomb be dropped on the area but thankfully it was never needed. 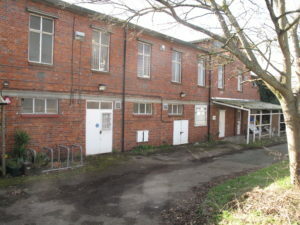 Since then it has been used as a store for the Education Department, a temporary children’s library (whilst the Hartley Ave library was being repaired following bomb damage), a venue for keep fit classes, a drugs and alcohol centre, a polling station, an archive centre and more recently a temporary nursery school. The last occupants were the Sea Cadets, who moved to the adjacent school in 2014, having been tenants in part of the building for some 50 years. The building is currently occupied by official Guardians who secure the building and prevent squatting and vandalism whilst it is not in public use. The NW7hub team have been working successfully with Barnet Council to transfer the asset to the charity. Our vision is to demolish the existing building and create a purpose built facility encompassing a cafe overlooking the park, a retail space, function suite and rooms for hire. Mill Hill Library in Hartley Ave will also be relocated to Daws Lane. The team are currently engaging with designers to gain planning permission to build the replacement community centre In the next 3-4 years of our funding and building programme we hope you will engage with us and enjoy everything we offer to the community in Hartley Avenue. Learn how you can support us on Get Involved.